Otto Klemperer talks about performing Mahler in 1936 in Peter Heyworth's book Conversations with Klemperer. 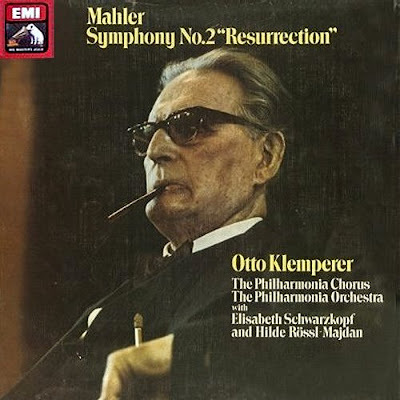 With Mahler's Second Symphony currently trending I turned to Klemperer's 1962 recording of that towering work. My LP set is seen above and the CD transfer is available in EMI's great recordings of the century series, and so it should be. Under Klemperer's baton in the Kingsway Hall were the Philharmonia Orchestra and Chorus, the latter trained by Wilhelm Pitz, soloists Elisabeth Schwarzkpf and Hilde Rössel-Majdan, with Walter Legge, Suvi Raj Grubb and Bob Gooch in the control room. Robin Golding says it all in the sleeve note when he writes about the "granite-like strength (no Bruno Walter-like sentiment in the central movements) and absolute authority" of Klemperer's interpretation. All this comes in sound that is of demonstration quality even by 2011 standards. This definitive interpretation should be in every CD collection and is currently available for around £4.99. That bargain price provides food for thought; in fact this recording of the century costs significantly less than either the Goats' Cheese Salad in the Royal Albert Hall Café Consort or the stuffed piquillo peppers with Capriola Farm goat cheese tapas at Bazaar in the SLS Hotel in Beverly Hills. So hurry before they change the menu. Heyworth: Did you find the programmes in America very dependent on box office receipts? Klemperer: Yes. On one occasion in Los Angeles I was asked to end Tchaikovsky's Symphonie pathétique with the third movement, the electrifying march. The manager wanted me to leave out the marvellous last movement. Naturally. I didn't do so. At least the BBC Proms has got that one sussed. In the Albert Hall the audience can applaud to their heart's content at the end of the electrifying march and hear the marvellous last movement. There is no Pathétique at this year's Proms. But Sir Colin Davis performance of Tchaikovsky's Fourth Symphony on Aug 24 with the Gustav Mahler Jugendorchester should be electrifying. There is also the Fifth Symphony with the Pittsburgh Symphony Orchestra on September 5 conducted by Manfred Honeck, who is joined by fellow IMG Artist Hélène Grimaud for a performance of Beethoven's Fourth Piano Concerto. Which cues my end link to one of those LA Phil music directors talking about the hot topic of classical music's mutual admiration societies. Following your recommendation, I just ordered the 1962 CD with Klemperer's recording of Mahler's Symphony No.2. Thank you pointing to this!